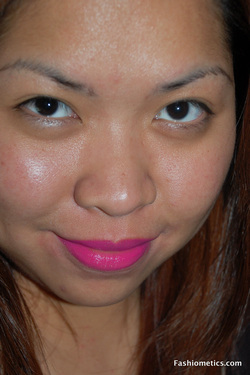 Today's review is featuring a drugstore gem: Wet N' Wild Megalast Lipstick. I am absolutely in love with these. They are cheap, but have the quality is just beyond my expectations. These lipsticks are semi-matte and are very very pigmented. Wet N' Wild Megalast Lipsticks are just great. They have an exceptional pigmentation. If you think their Silk Finish Lipsticks are good, you'll like these even more. I think these easily fall in the top 5 best drugstore lipsticks out there. They are just phenomenal. I went to Ulta today to buy my favorite heat-protectant spray, and visited their nail polish display and saw they now carry the brand Zoya. I've been buying my OPI nail polishes at Ulta, and I've never seen Zoya at Ulta before. I was really curious with these nail polish since I've read reviews about them online. I only saw 3 different colors of Zoya's Matte Velvet Lacquer line: turquoise, chartreuse, and this hot pink that's featured in this first impression post. I was going to get the turquoise, but since pink is my favorite color, I went with it. At first, I was impressed how quick this nail polish dried. I think after 15 seconds, you're good to go. This nail polish has no glitter, no sheen, nor shimmer -- it is matte after all. It looks as if your nails are painted with watercolor, and I think that's the best way to describe its texture, too. You can buy these for $7.00 at Ulta stores. 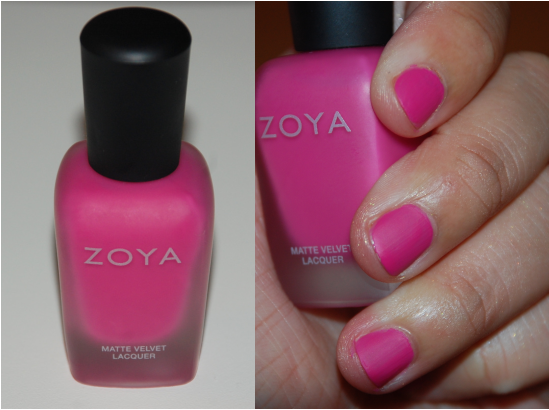 "Matte Nail Polish color by Zoya is intended to be worn with a base coat, but not a top coat or speed dryer of any kind. Due to the unique matte Zoya Matte Nail Polish color is not as long-wearing as traditional nail color. A completely clean, dry nail surface yields the best results for matte nail color wear. For best results make sure to always prepare nail with Zoya Remove (3-in-1 nail polish remover, nail plate cleaner and new color prep) prior to applying color." Everyone seems to be talking about their beauty/skin care routine. Now, I'm here to share you beauty tips that I know and read through blogs, magazines, and through word of mouth. 1. 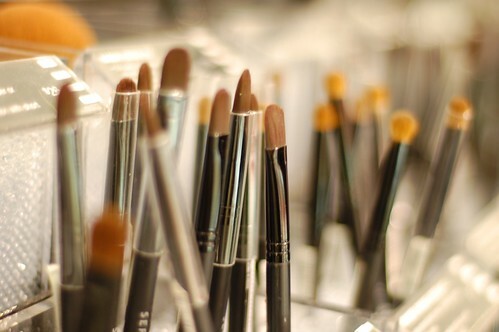 ALWAYS, I repeat, ALWAYS wash your make-up brushes after use. Bacteria grows in those tiny bristles so make sure you wash your brushes before using them again. I am, sometimes, guilty of this crime and I suffer the consequence -- ACNE! So please, ladies, do yourselves a favor. Spot clean them using a brush cleanser, or use a baby shampoo to clean the hair. 2. Have a good and consistent skin care routine. Wash your face in the morning and at night. If you have sensitive skin, make sure you have a gentle cleanser. If you have dry skin, use a creamy face wash, and if you have oily skin, use foaming face washes. This is optional: follow with toner. Choose a good moisturizer. During the day, pick a moisturizer with an SPF of at least 15, and at night, choose a cold cream which will moisturize your skin overnight. 3. ALWAYS remove your make-up before going to sleep. I know, I know, life could be hectic sometimes, but that's not an excuse to leave your make-up on your face while you're sleeping. Make sure you have a good make-up remover or have a cleanser that removes your make up. However tired you are, you SHOULD remove your make-up before going to bed. There have been a lot of youtubers who raved about this product, this über cute product -- the EOS Lip Balm! And of course, I gave in. It was only a couple of bucks, so why not. I had this lip serum that I use every night, and since I'm running out of it, and I can't find it anywhere else for the price I wanted, I'm not really ready to spend $20 for a lip serum that I'm probably going to use for a while, but still, I can't spend that much money on a colorless lip serum. And then there's EOS lip balm. I chose the scent (because there are no "shades" for these lip balms) Honeysuckle Honeydew. I also chose the one without an SPF since I will be using these during nighttime as well since I like putting on lip balm before I go to sleep. For the next few days, I will be reviewing numerous lip products since I have A LOT! :) Yes, I love lipsticks, lip glosses, and lip balms. 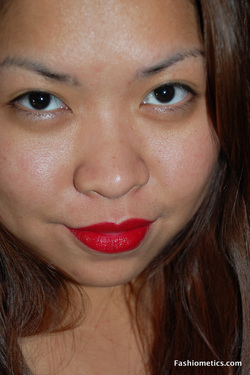 I'm addicted to them, and of course, the new CoverGirl LipPerfection Lip Color is not an exception. Since I've had these for a while, they are not really new. But the LipPerfection Lip Colors are new for 2011. * From CoverGirl: Bright, gorgeous color that can transform your day and your lips. Enriched with a silk moisturizing complex, our formula helps sustain moisture levels and helps create soft, smooth, beautiful lips in just 7 days. As you can see in the photos I posted for this review, these lipsticks are really pigmented. Those swatches are only one swipe! Yes, ONE! The formula is creamy; they are moisturizing so you wouldn't have to worry about these lipsticks making your lips dry. I've worn these a couple of times, and sometimes, I put on lip gloss on top of these so I could make strong colors - like Euphoria - a little bit toned down. Achieve attractive plum pout without getting collagen injections with Wet n Wild Megaplum Lip Gloss! Infused with Vitamins A, E & aloe vera, Megaplum Lipgloss soften and moisturizes as well as instantly plump lips with a shiny finish. Getting perfect pouty lips does not need to be painful and expensive! I wasn't really sure on what to expect with these kinds of products -- cheap, basic packaging, and cheap. Boy, did these lipsticks prove me wrong. It's not all about how the product looks, but how it functions. The color pay-off is amazing! I can't even explain how great these lipsticks are. I've only tested two out of the many shades they have. I'm not a big fan of frost finishes so I've only purchased the cream ones. So far, I really like them, especially Pink Nouveau. I was really surprised with both of the lipstick's quality. They glide on smoothly, and there were no streaks. The color is opaque. Swipe two times, and you are done! I really can't compare it to any of the other lipsticks I own, as they stand out by themselves. As for how this lipstick feels, it feels creamy and moisturizing. I only bought two of the shades that I feel like I'm going to use, so I'm not sure how well will the rest will be - quality wise, but I'm guessing they are all about the same. As for wear, I've worn Pink Nouveau for 2 hours last night before removing it, and it didn't bleed nor fade, but I haven't tested long enough. Hopefully, I could write another review about these soon. Although the packaging is the basic, lightweight plastic tube, it functions properly. You may have to be careful while removing the cover, but that's the only downside I can see.